I was joined by Ken Sherlock, another Brandon regular, for an intense days birding on the north Norfolk coast on Wednesday, arriving at our first stop of Holme Dunes shortly after 7am in glorious weather. 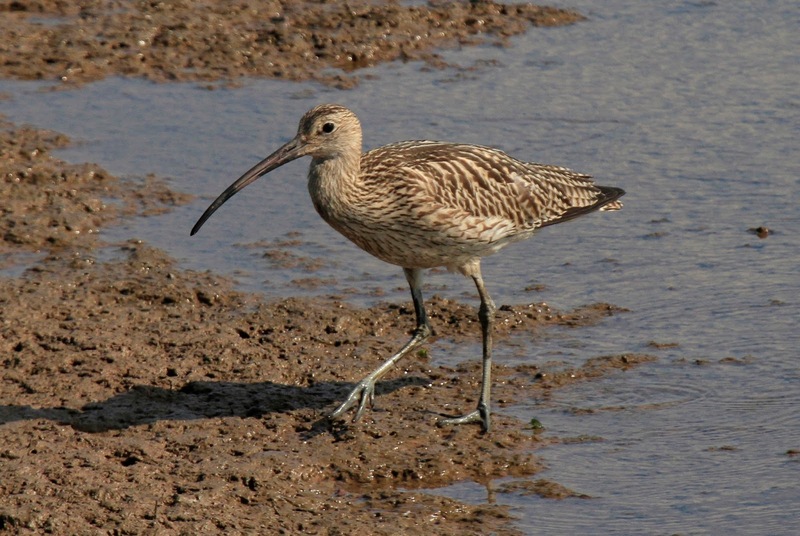 Curlew - good numbers today! Parking at the Beach Road car park near the Royal West Norfolk Golf Club our first bird of the day was a Hobby, when one was hawking over one of the greens as we approached the boardwalk. From here we took the well maintained coastal footpath, eventually ending up at the Holme Bird observatory. There are a range of coastal habitats including sand dunes, freshwater pools, grazing marsh and saltmarsh to explore. Much of the site consists of natural habitats maintained largely by coastal processes. Wall Brown - Lots along the coastal path. Even at this early hour the heat was building, allowing a good deal of butterflies to take to the wing. These included Wall Brown, Small Heath and Small Tortoiseshell, a single Clouded Yellow flew east across the sand dunes. Along the shore line a constant flow of Terns were noted, Little, Sandwich and Common, the latter included good numbers of juvenile. A Marsh Harrier flew high in from the sea and during an extended sea watch Arctic Skua and Great Skua (bonxie) were seen, the bonxie giving a Lesser black-backed Gull a really hard time! Up towards the observatory a small fall of Meadow Pipit and the return walk produced a Mediterranean Gull, which flew west over the dunes. 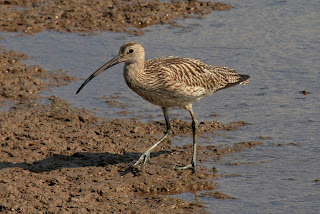 A list of other species compiled upon returning to the car park contained: Barn Swallow, House Martin, Blackcap, Chiffchaff, Whitethroat, Bullfinch, Little Egret, Bar & Black-tailed Godwit, Sanderling, Oystercatcher, Turnstone, Dunlin, Redshank, Spotted Redshank, Ringed Plover and Curlew. By the time we reached RSPB Titchwell the temperature had reached the high 20's and here we met up with Pete Worthy, another Brandon team member who happened to be staying locally. Along the west bank path towards the beach at least (5) Spoonbill, including a juvenile on the freshwater marsh, two further Marsh Harrier, plus Cetti's Warbler, Linnet, Juvenile Shelduck, Ruff, Ringed & Little Ringed Plover, Greenshank, Redshank, Black-tailed Godwit, several Curlew Sandpiper, Avocet, Snipe and Dunlin. Lunch on the beach produced juvenile Eider on the sea, but unfortunately with the tide well out a reasonably quiet period produced nothing more of note. Late afternoon, Norfolk Wildlife Trust Cley Marshes in 29C and a good look at Pat's Pool. Here at least (5) Curlew Sandpiper, Green and Common Sandpiper, Ruff, Dunlin and our only Little Stint of the day. Wildfowl consisted of Wigeon, Teal, Gadwall, Tufted Duck and Shoveler. A reported Pectoral Sandpiper was apparently showing well from the Bishop's Hide, unfortunately just as we were about to move across for a look a juvenile Peregrine dashed our hopes, scattering the whole pool in typical fashion. At Bishop's Hide a painstaking search for the now displaced Pectoral proved negative, the third time I've bombed on a Pectoral in Norfolk, (3) Egyptian Geese were the final notables, ending a long and fruitful day. In typical fashion while enjoying Norfolk, news came through locally of a Spotted Crake at Napton Reservoir. After the initial disappointment, I'm happy to report that thanks to John Judge I caught up with the bird just before dusk this evening, a super little shy bird and well worth seeing. On another positive note, at least 35/40 Yellow Wagtails also came in to roost at the reservoir during my visit, another local mystery solved.